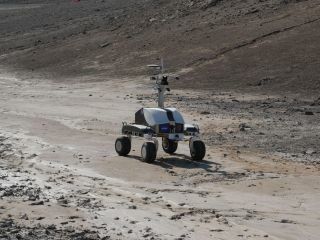 K10 rover is to be controlled by astronaut onboard the International Space Station in telerobotics experiment. Next year, a set of sophisticated experiments are planned to utilize the talents of astronauts onboard the International Space Station (ISS) to control robotic hardware on Earth. The tests would spotlight the feasibility of telerobotic deployment of science experiments, critical equipment and structures at distant spots in the solar system, be it on the moon, at asteroids, or on Mars. The moon's farside is a possible early goal for missions beyond low-Earth orbit using NASA's Orion Multi-Purpose Crew Vehicle in tandem with teleoperated robots. The lunar L2 Lagrange Point is a location where the combined gravity of the Earth and moon allows a spacecraft to be synchronized with the moon in its orbit around the Earth, so that the spacecraft is relatively stationary over the farside of the moon. Such an L2-Farside crewed mission could have astronauts remotely deploy a unique polyimide film low radio frequency antenna or array in the proven radio-quiet and ionosphere-free zone of the farside, said Burns, science gear that can track down the "cosmic dawn" of the universe shortly after the Big Bang. he ESA-led Multi-Purpose End-To-End Robotic Operation Network – METERON -- is expected to improve ways to put the human touch on other worlds. To help shake out the telerobotics concept here on Earth, preparations are in full-swing to perform research in the summer of next year, said Terry Fong, director of the Intelligent Robotics Group at the NASA Ames Research Center in Moffett Field, Calif.
"Our testing is going to have real-time commanding back and forth," Fong told SPACE.com. "We have a fairly significant amount of testing time … about 11 hours of operational time with an astronaut on ISS." Fong said that these tests are essential to hone human-robotic interactions. "We don't know what we don't know," and next year's experiment is just a starting point. "I'm excited that we're breaking new ground here," Fong said. Europe's Multi-Purpose End-To-End Robotic Operation Network program is delving into intuitive and dexterous control of robotic systems, be they touch interfaces, force reflective joysticks, and arm exoskeletons. At the Ames center, a football field-size test area is being prepared, dotted with some craters and rocks, and features hilly terrain and a small mesa, Fong said. The K10 robot has already undergone extensive testing, he said, such as field trials in the Canadian arctic and desert locales. The K10 is a speedy beast, contrasted to an earlier rover design. It also hauls more payload and is a more flexible research platform, Fong said, and is fully equipped with cameras and laser scanning gear. Next year's experiment will include three crew sessions, each three and a half hours long and carved up in phases: survey the site, deploy the array, and inspect the completed work. "We are trying to carry this out as a simulation of different phases of deploying a lunar telescope," Fong said, using a small deployer on the back of the K10 to roll out the plastic film array. There will be some on-the-job training for the astronauts engaged in the telerobotics work. But Fong said the objective is to minimize the amount of astronaut training time involved. "The robot interface is being set up to be highly usable," needing only perhaps an hour's worth of prep time. "Our philosophy here for the past several years is robots for human exploration. There are a lot of features of both that are very complimentary. It's not human versus robot. It's more how do you best use humans and robots together," Fong said. The ultimate goal of the experiment is to get more human capability for exploring Mars, Fong said. "One of those things on the table is the idea of having humans in Mars orbit, controlling robots on the surface." The European Space Agency's (ESA) Multi-Purpose End-To-End Robotic Operation Network – Meteron, for short – is designed to validate future human-robotic mission operations concepts from space, using the ISS. Also on tap to start next year is telerobotics work using the European Space Agency's (ESA) Multi-Purpose End-To-End Robotic Operation Network — Meteron, for short — designed to validate future human-robotic mission operations concepts from space, using the International Space Station, and tied to technologists in Europe. All this is prelude to permit humans from orbit to execute complex tasks remotely, such as setting up engineering structures on faraway celestial surfaces via teleoperated robots. Earth to rehearse and research what we'd need for future orbiting stations around other celestial bodies," said Andre Schiele, Meteron Robotics principal investigator. He also heads the ESA/European Space Research and Technology Center's (ESTEC) Telerobotics and Haptics Laboratory in Noordwijk, the Netherlands. Schiele said the Meteron research in an "endless" microgravity environment offers new insights about the perception of "haptic" (relating to the sense of touch) and "tactile" feedback within that environment. "Moreover, little is known how other human perception relevant to telerobotic activities is influenced," he said. While the procedural requirements for using the ISS for such experimentation are heavy, it would be significantly more difficult to perform such testing elsewhere," Schiele told SPACE.com. The ESA/ESTEC effort is set to look into such issues as time delay, communications bandwidth, as well as how best to allow intuitive and dexterous control of robotic systems, be they touch interfaces, force reflective joysticks, and arm exoskeletons, Schiele said. Meteron will allow us to design the system for optimum shared human/robotic presence," he said, "to make telepresence better and more efficient."